"Image Ownership: Oregon Historical Society"
Albina is a neighborhood located in Northeast Portland, Oregon that for most of the 20th century was home to the majority of the city’s African American population. Before it was annexed into Portland in 1891, Albina was a rapidly growing city on the east side of the Willamette River from Portland. During the 1870s and 1880s, Albina’s population consisted mostly of new immigrants from Europe who worked at the Union Pacific Railroad terminal or on the docks. In the 1890s and 1900s, wealthy Portlanders from across the river began to purchase land in Albina. Most African American residents of Portland at the time rented homes or apartments on the west side of the river, closer to the city center. By 1910, the black neighborhoods of northwest Portland were too crowded, and black Portlanders began to cross the river to look for homes, often choosing Lower Albina for its proximity to jobs at the docks or with the railroad. In response, the newer white neighborhoods of east Portland began adopting restrictive covenants, effectively confining African American home-seekers of east Portland to the Albina neighborhood. Lower Albina remained one of the few places African American families could live or work in the Portland area until the eve of World War II. Shipbuilding yards along the Columbia River drew thousands of workers from around the United States, increasing Portland’s black population from 1,931 in 1940 to more than 20,000 in 1945. Most of the newcomers lived in Vanport, an integrated community housing development along the Columbia River created to accommodate shipyard workers. When Vanport was destroyed by the Columbia River flood of 1948, over 16,000 people were displaced. Black residents who lost their homes were faced with a difficult choice: return to their hometowns or try to resettle in the very few parts of Portland available to them. Homeless and unemployed, the new residents of Albina mostly rented rapidly aging homes or apartments vacated by white Portlanders bound for the suburbs. By the early 1950s Portland’s black community life centered on Williams Avenue. Former defense industry workers, unable to find jobs in white businesses, opened their own shops, restaurants, and clubs to serve the black community. By 1956, however, the now mostly black neighborhood of Albina was declared blighted with least 60% of the housing sub-standard. 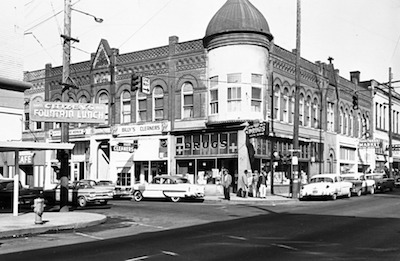 Residents of Albina responded by forming the Albina Neighborhood Improvement Project (ANIP) in 1961 and requesting federal funds to rehabilitate the structures in the heart of the black community. When residents tried to expand the scope of this program, they discovered that the City of Portland had other plans for Albina. The Portland Development Commission’s 1962 Central Albina Study found the area, which now contained 80% of Portland’s black population, to be in a stage of “advanced blight.” The Commission declared, “clearly urban renewal, largely clearance, appears to be the only solution to not only blight that presently exists in central Albina, but also to avoid the spread of that blight to other surrounding areas.” When this report was published, landlords in Albina began to evict tenants, demolish buildings, and sell the land. The Eliot neighborhood was especially hard-hit by urban renewal projects: as Portland planned and built the Veteran’s Memorial Coliseum and Highways I-5 and 99 in the 1950s, the Rose Quarter in the 1960s, and expanded Emmanuel Hospital in the 1970s, over half of that neighborhood’s black population was forced to relocate. In the late 1960s Albina community leaders and Portland city officials participated in a Model Cities program funded by federal War on Poverty programs. Independent, black-run organizations like the Albina Corporation and the Albina Art Center were formed to create jobs and enrich the cultural and intellectual life of Albina. Despite their best efforts, grassroots community organizations could not prevail against the increased disinvestment in Albina in the 1970s and 1980s. Discriminatory housing policies throughout Portland continued to lock Albina residents in to a housing market run by absentee landlords, speculators, and predatory lenders. The Crips and the Bloods began to operate in Albina, selling crack cocaine at higher prices than in Los Angeles, California. As unemployment, drug use, and violence intensified, families who could afford to move out of Albina fled, leaving behind even more abandoned properties. In the 1990s, the City of Portland began to revitalize Albina. Following the gentrification model used in various cities across the U.S., the Portland Development Commission offered favorable loans to home buyers and business owners from outside Albina who were attracted to the remaining Victorian homes, low prices, and convenient location. Most of the loan recipients, however, were young and white. Home values in Albina tripled or quadrupled in the 1990s, effectively driving out lower-income, mostly black renters and homeowners. In the 21st century, the gentrification of Portland’s eastside has continued to take a toll on Albina: The neighborhood that was once 68% percent black in 1990 was 28% in 2010. Kimberley S. Moreland, History of Portland’s African American Community (1805 to the Present), City of Portland Bureau of Planning, 1993, https://multco.us/file/15283/download; Mark Friesen, “Graphic: Portland’s Central City Gets Whiter,” The Oregonian, April 30, 2011, http://www.oregonlive.com/pacific-northwest-news/index.ssf/2011/04/graphic_portlands_central_city_gets_whiter.html; Richard Ross, Ralph Ahselhn, and Malcolm Cross, Albina: Portland’s Ghetto of the Mind, KGW Broadcasting, 1967, http://legacy.kgw.com/story/features/2013/07/10/documentary-albina-portland-s-ghetto-of-the-mind-1967-/11775000/; Trudy Flores and Sarah Griffin, “The Albina Riot, 1967,” The Oregon Historical Society, 2002, http://oregonhistoryproject.org/articles/historical-records/albina-riot-1967/#.Vuh7AxIrKXQ; Tanya Hyatt Evenson, Sarah Griffith, and Amy E. Platt, “Albina Residents Picket Emmanuel Hospital,” Oregon Historical Society, 2002, http://oregonhistoryproject.org/articles/historical-records/albina-residents-picket-emanuel-hospital/#.VwFZ5Uc73d6; Karen J. Gibson, “Bleeding Albina: A History of Community Disinvestment, 1940-2000,” Transforming Anthropology, vol. 15, issue 1, 2007; Stuart McElderry, "Building a West Coast Ghetto: African-American Housing in Portland, 1910-1960," Pacific Northwest Quarterly, 92 (Summer 2001).